An espresson and water, like any civilized person would have. Greetings from the road. I’m sitting in a Peet’s Coffee in Portland, on the second leg of the Afterparty Tour. Tonight I read and sign at Powell’s in Cedar Hills Crossing at 7pm. 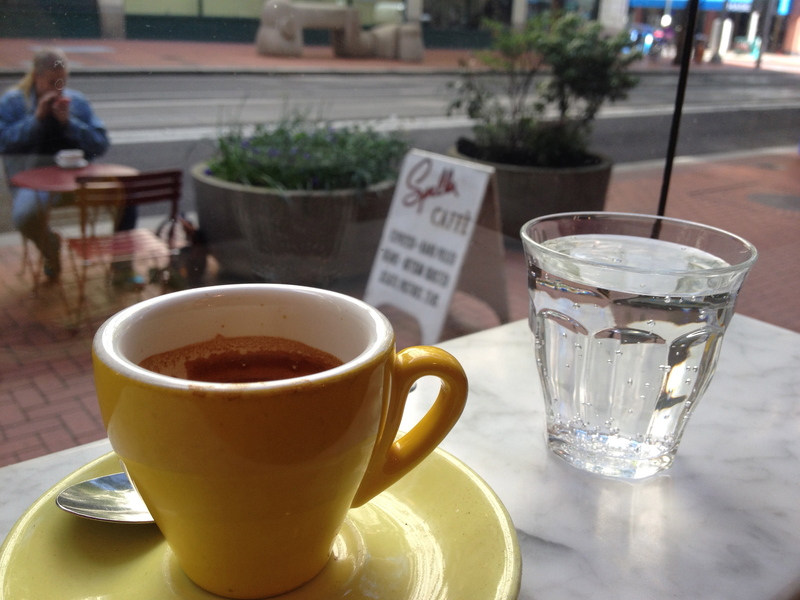 This is my third coffee today — the first was espresso at Spella Cafe (left). Then I walked around downtown, had (at Scott Edelman’s suggestion) a Portland Creme donut at Voodoo Donut, had more coffee, then met up for lunch with pals and fellow writers Chris Roberson and Paul Tobin. Life is good in Portland, my friends. Signing at the B&N. Photo courtesy of Monique Nethercott. 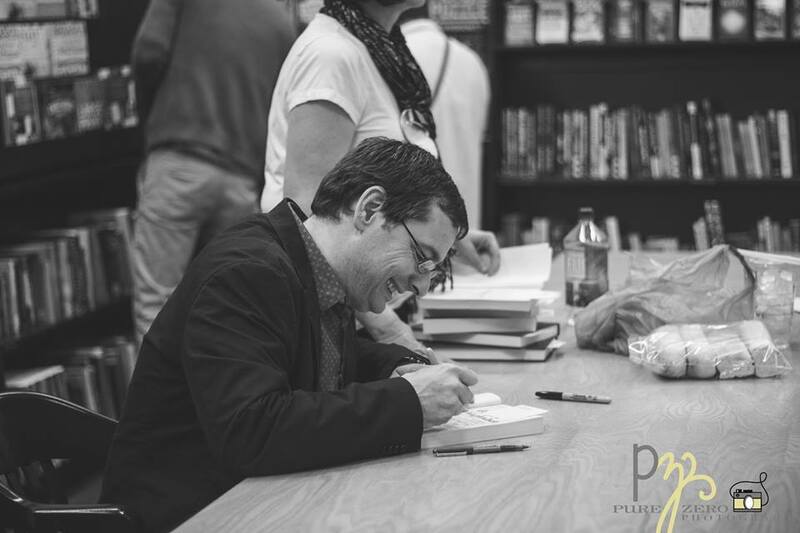 Two days ago in Oak Brook I signed and read for the hometown crowd, and it was a blast–especially the part where friends from high school and college came out of the woodwork. The day before that was an SF panel at C2E2 with Gary K. Wolfe, John Scalzi, and Misty (M.D.) Waters, and a fabulous dinner with Tor folk at the City Winery, where Mary Robinette Kowal’s husband is the winemaker. But I wanted to take a second to talk about the Afterparty Launch Day on April 22, and the many bloggers, reviewers, and friends who put out the word about the book. There were so many interviews, guest blog posts, and reviews that I didn’t have time to even tweet them all. A full list would take a couple pages of scrolling, so let me mention the highlights. The reviews were quite nice. Karen Burnham over at SF Signal is one of my favorite reviewers–and not just for my books. She has some very thoughtful things to say about Afterparty, and I’m very pleased that she “devoured” the book. Jason Sheehan at NPR also gave the book a “juicy” review; you’ll have to read it to see what I mean. On the interview front, Amazon Books Blog ran a fun Q&A. I had an extended conversation with Andrew Liptak at SF Signal. And I had great interviews with Sarah at Bookworm Blues with Kristin at My Bookish Ways. There were quite a few more Q&As across the internet–which are all on twitter right now, but I’ll post them here. Sarah Chorn, who also runs Bookworm Blues, has a series on SF Signal called Special Needs in Strange Worlds. where she allowed me to write about “Minds, Bodies, and the Three D’s.” John Scalzi gave me space to write about the Big Idea in Afterparty to talk how the brain is lying to us all the time. And Lawrence Schoen gave me a spot at the table in his Eating Authors series to talk about the best meal I ever had, which happened to be in Toronto, where Afterparty is set. I just finished reading Afterparty. I loved it so much. Right from the beginning, you had me with how you introduced Dr. Gloria. Thanks for writing this book! Hi Daryl…I don’t know if you remember me, but at the Worldcon on San Antonio I raised my hand and announced that you were an unsung genius, primarily for Raising Stony Mayhall. It was a zombie panel I presume. Just began reading Afterparty. I am looking forward to seeing you at Readercon. At first I wasn’t going to attend, as I abruptly lost my job as associate veterinarian at the clinic I worked at ( my choice) and am still looking for a permanent position, but I love Readercon too much, and with you, John Clute, and James Morrow there….well I decided I deserved it after my traumatic work separation. I have several copies of Stony Mayhall for you to sign to friends of mine who are zombie subgenre aficianados. By the way, have you see the film Stakeland. Absolutely genius zombie/vampire film, compelling,heartbreaking, and poignant. I always remember when people call me a genius! My condolences on the work trauma, but I’ll be glad to see you at Readercon. Please introduce yourself so I can put a face to your name. Hope you dig Afterparty! Been reading Afterparty and loving it and then hit The Parable of the Child Theif and the shock of recognition was like an electric current through my brain. I was, some fifteen years ago, the Program Director for SOS Children’s Village in Lockport! The great thing was even though I had such a connection to an inspiration point for the parable, it did not take me out of the Afterparty world for more than a moment or two. Truly a sign of great writing! Loved Raising Stony Mayhall as well and have The Devil’s Alphabet and Pandemonium in the to read pile as well, all courtesy of Indian Prairie Public Library. Would love to hear how you came to know of the Village and what your perception of it is…….when I was there we flew pretty far under the radar. I wish I’d met you before I’d written that scene! I grew up in Darien and didn’t know about the Village. I ran across a mention of it on the internet, then started reading more. I thought the village was a pretty innovative idea, but it would have been great to talk to someone who was actually there. I hope it didn’t offend you or other readers who might know of it. — and obviously I made up staff names and backgrounds. Thanks for reading Afterparty, and I hope you dig the other books! I don’t think any one who lived or worked or at the Village would find what you wrote offensive in any way. I certainly did not and your recognition that it was an innovative approach to foster care showed more insight than many of the functionaries in the Illinois child welfare system ever did. It is is still open though running along more traditional lines now at the Lockport site. They also opened a Village in Chicago that is more akin to the way SOS Children VIllages are run worldwide. I’ve been living in Darien since 1990 so our residencies may have overlapped. I did actually try to get to your recent signing at B&N in Oak Brook but family matters necessitated missing it. Are you perhaps going to Detcon 1 or any of the other Midwest conventions? Perhaps we’ll cross paths another time. Btw, I finished Afterparty this afternoon……great book, loved the neuroscience/religion interplay and the impact of NME 110 on the various characters,particularly Edo. There are times I wouldn’t mind having a Dr. G hanging around! On to Pandemonium.